Create columns in Meta Box Builder? The map field creates a Google Maps where you can select a location. This field comes along with a text field for address input, which has the autocomplete feature. 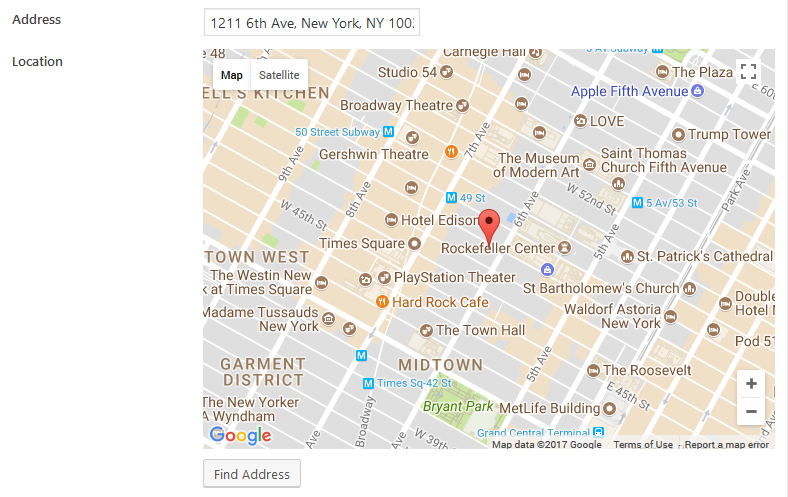 The data for address autocomplete is get from Google Maps Geocode service. You also can pick a location simply by clicking on the map or drag and drop the marker. api_key Google Maps API key. Get here. Required. language Google Maps language. Optional. Default is English. See list of language code. region The region code, specified as a country code top-level domain. This parameter returns autocompleted address results influenced by the region (typically the country) from the address field. See here for more details. Optional. address_field The ID of address field. For multiple address fields, enter field IDs separated by comma. Required. Note that in order to make the map works, you need to create a text field for address and pass its ID to the map’s address_field. The address_field can be also a list of text input fields’ IDs, separating by commas. For example: street,city,state. But in that case, there’s no autocomplete for address. Instead of that, when you click the Find Address button (below the map), the field will search for the address combined from values of those fields and set the location for the map. Without a valid Google Maps API, the map won’t show. Get a key here. Make sure you enabled the Geocoding API to make the autocomplete feature works! This field saves the location in the following format latitude,longitude,zoom. width Map width, default is 640px. Can be ‘%’ or ‘px’. height Map height, default is 480px. Can be ‘%’ or ‘px’. zoom Map zoom, default is the value set in admin, and if it’s omitted - 14.
marker Display marker? true (default) or false. marker_icon URL to the marker icon. Optional. marker_title Marker title when hover. If you have a map inside a cloneable/non-cloneable group, then the helper functions above doesn’t work. In that case, you can use a helper function in the plugin to show the map. $location The location of the map center / marker, in format latitude,longitude[,zoom] (zoom is optional). It’s the same format of the map field value. $args Additional parameters for the map. The same as for helper function rwmb_meta above. This filter allows developers to add more libraries or change the Google Maps URL. It accepts single parameter - the URL of the Google Maps script and should return an URL.